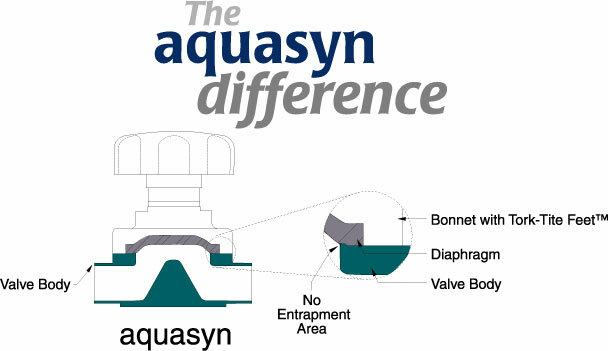 Aquasyn has developed the ultimate high purity valve for the bioprocess and pharmaceutical industries, setting a new standard in engineering, design, and manufacturing. The innovation and high quality of this new Aquasyn product provides the customer with a series of excellent benefits. The complete product line includes special innovations such as the valbow and the sample bottle assembly valve. 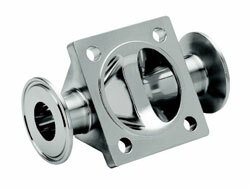 Aquasyn valves feature Tork-TiteTM Feet diaphragm stops; high quality body material that exceeds the industry standards; all stainless internal components; unique UltrazTM USP diaphragm material; machined stainless steel bonnet; smooth operating, high temperature, plastic handwheels; customized solutions; and high quality actuator feet. Benefits include much longer life cycles, lower maintenance costs, excellent delivery capabilities, customized combinations, easy to configure and order, state of the art surface finishes (inside and out), and best cost of ownership. Exotic materials available, such as AL6XN, Hastelloy, Titanium, and more! Aquasyn produces the widest variety of custom products in the industry including Valbow, Sample Bottles, manifolds, and many more!